Wet leisure marketing specialist Dorian Davies is urging hot tub and swim spa dealers to ramp up their promotion capabilities to avoid becoming a victim of the economic fallout from the Brexit vote. 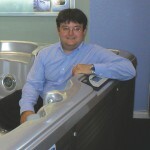 Doric Marketing chief Dorian, pictured, believes that even though the majority of dealers are taking advantage of the flourishing wet leisure industry they should still be implementing marketing initiatives and promotional plans to help boost customer numbers; which could be critical in the event that the demand for hot tubs and swim spas decreases due to a slump in consumer confidence as a result of economic uncertainty, following the British vote to leave the European Union. Before Britain’s historic Referendum vote, hot tub and swim spa dealers reported that they were confident of building on record-breaking sales from 2015, which was reflected by wet leisure product specialist Golden Coast providing the results of its fifth Wet Leisure Industry Survey, in partnership with the British Swimming Pool Federation (BSPF), which revealed a rise in sales of hot tubs last year by 20 per cent. Two weeks after the EU poll the wet leisure market has now been boosted by the news that a number of leading investment banks; including JP Morgan, Morgan Stanley and Goldman Sachs; have joined Chancellor George Osborne to declare that the City of London will remain the world’s dominant financial centre. The National Institute of Economic and Social Research has revealed this week that the gross domestic product – the total size of the economy – increased by 0.6 per cent in the second three months of the year. Analysts are also predicting that the Bank of England will cut interest rates to 0.25 per cent next week to ensure the economy keeps moving positively. This comes after doom-laden warnings and a report by research group GfK, though, that highlighted that consumer confidence has fallen at its fastest pace for 21 year, following the Brexit vote. It has prompted Dorian and his Doric Marketing team to warn wet leisure specialists to prepare for any eventualities with modern marketing strategies. “There may be mixed messages about the economic prospects for Britain after the Brexit vote but one thing is for sure, the wet leisure industry can’t afford to be complacent in any way and should be prepared for any eventualities,” said Dorian. “Even those dealers who have flourished for many years and overcome the tough times during the last recession should not take things for granted. They may be on the crest of a sales wave now but they should be looking at their operations to see where they can improve their marketing and enhance their business profitability. “When it comes to marketing, the best strategy is to be constantly promoting your business and utilising all of your resources to generate new customers. Yet, it is also very important to continue to promote your services to your existing customer base. To highlight how the British economy and wet leisure market is coping with the Brexit vote and financial uncertainty in the coming months, HTR’s editorial team and Economic Correspondent Alex Clamp will be monitoring the situation and providing online updates. Dorian has stressed, though, that whatever the financial outcome of Brexit in the years to come hot tub and swim spa dealers who want to remain profitable in the industry must ensure their showroom, product portfolio and marketing material is of a high quality to provide prospective customers with the confidence to make purchases. 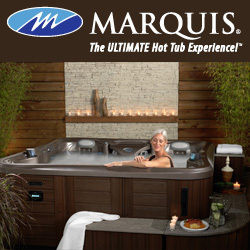 “Many dealers have been moving to larger premises in recent years to capitalise on the growing demand for hot tubs and swim spas but it is important to maintain high standards at all times to prevent marketing campaigns falling at the final hurdle, because prospective customers don’t like what they see in showrooms or are unhappy with poor customer service,” said Dorian. According to feedback from hot tub dealers, the driving force for sales last year was from customers seeking a mixture of health and wellbeing as well as a high percentage requiring products for fun and relaxation. Dorian believes that providing a wide choice of options to cater for the distinctive demands from various demographics is also an important factor to help clinch sales. “Feedback from dealers has indicated that health and wellness alone is not yet a significant factor for purchasing a hot tub, so it is important to be able to cater for the demands from prospective customers who are seeking hot tubs for fun and socialising purposes with their family and friends. “Having a wide range of products and plenty of variety of options in your showroom can prevent the loss of a sale to a competitor. If dealers have not yet covered all of their price range bases then they should be seeking out a pedigree brand to fill any gaps. “Any new models that are introduced to the showroom should be heavily promoted on websites and via social media, and linked up to specific marketing strategies. “During the past couple of years I have been highlighting the fact that the industry has got to move with the times and adopt modern marketing practices and enhanced online promotional strategies. Currently, though, there are many different levels of promotional activities being operated within the industry. “A number of leading hot tub retailers and wet leisure specialists, who have been hitting record sales and have landed prestigious BISHTA and SPATA awards, are tuned into the marketing potential from the latest online technology. They have enhanced their websites and social media capabilities to take advantage of the boom in the use of mobile devices. “Many dealers have invested very heavily in new websites that are compatible with mobile devices and are quite rightly reaping the rewards of bumper sales of quality hot tubs and swim spas thanks to increased footfall in showrooms. “Then there is now another group of retailers and companies who I’m speaking to who are seeking to catch up with their competitors by adopting similar modern marketing strategies to promote their quality brands.